I have always liked cop shows. We called them "shoot-'em-ups". You know, the movies where the bad guys were bad, and the cops were good, and hereby the conflict between good and evil begins anew. I especially like the ones with a lot of shooting and showing the latest and greatest weaponry. Reflecting upon memorable times of my youth, I would pull out my Red Rider BB gun and no longer be the freckle-faced short little kid from the hills of Tennessee, but be Chuck Connors shooting the bad guys. I would twirl the Daisy replica of an old Colt single action revolver much like the outlaws I saw in the movies, and pull off a hip shot that was impressive, at least to myself. Forget that you could outrun the BB coming out the end of the old Daisy barrel (or that you could shoot your little brother in the back at 8 paces without drawing blood); it was the dream that mattered. Later in life, I loved the scene of Rambo coming out of the water with a M-60 machine gun. Or watching a sniper in the jungle take out a Viet Cong at 400 yards with one shot between the eyes. Ah, the things entertainment is made of. Much like most of you (if you will admit it), we never really outgrow the loves of our youth. I still like fast cars. I still like motorcycles. And, I still like "bad guns". This brings us to the gun in this test. 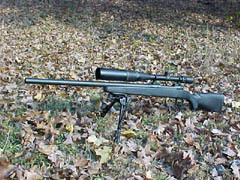 A short time ago, I desired to build the ultimate affordable bolt-action sniper (I mean varmint) rifle. Note that I said "affordable". There are several excellent rifles on the market that can equal or better the accuracy of the gun in this test (McMillan, Armalite, etc. ), but I wanted to build and test a gun that most of my friends could easily afford. So, I set out to investigate a fine building block for this rifle-scope setup, and after much research, determined that I would shell out my bucks for one of the Savage .308 bolt-action Tactical models. An excellent choice, it turns out. This rifle is basically the same as the tactical rifle used by police departments across the country. Excellent bolt feel. Recessed target crown. Heavy bull barrel. Crisp trigger pull. .308 NATO round. Matte finish. Durable composite stock. Weight is around eight pounds empty. The Savage has good balance, and an excellent finish. The non-glare black matte finish, while being protected from the elements, is beautiful. Accuracy and reliability are trademarks of the Savage Tactical. And, the price is right. For what one gets when the transaction is made, this is truly a bargain. I never shot the rifle until the "package" was complete. I had to have a scope and a bipod setup to allow greater practical accuracy at long distances. So, once the rifle was procured, I went shopping for a scope. There are a lot of excellent scopes on the market today. After reviewing many scopes in terms of several factors (quality, reliability, matte finish, and price), I selected the excellent Bausch & Laumb Elite 4000 series scope in 6 to 24 power It features a sturdy tube, matte finish, excellent optics, great reticle, easy adjustment in the field, long sunshade; all at a price equal to a much lesser scope by other major manufacturers. To help steady the rifle-scope setup for long ranges, no sniper/varmint rifle would be complete without a good adjustable bipod. I selected the excellent Harris swivel model, which fits nicely on the front of the Savage handguard and barrel. Now, the setup is complete. A great-looking (and we will soon discover a great-shooting) package. One bad gun. The things of which great "shoot-'em-ups" are made. After some massaging of the package by my brother Jeff, we determined it was time to take this fine-looking package to the field. Due to the limited range available for shooting from the bench, all tests were done at 100 yards. The Savage grouped extremely well with the ammo tested. However, the real test of a tactical or counter-sniper rifle is it's ability or lack thereof to place one shot, on target, from a cold barrel, every time. It must be reliable in this regard or it is useless for it's intended purpose. As you can see from the photo, this package can deliver. Five or ten shot groups are not important in a tactical rifle. It's that first shot that matters. If tight groups are your thing, as in benchrest matches, the Savage can do that too. But so can many other rifles. If you need an all day varmint rig, you probably won't choose the .308. But if you need to know that you can place one bullet exactly on target every time, and not have to mortgage the farm to do so, this is your baby. - J.Q. If you are in the market for a great-looking and great-shooting varmint or sniper package, I suggest you consider building one like mine. You might select another scope, and you might elect to do something differently regarding our bipod treatment. But, you would be hard-pressed to find a more accurate and reliable basis upon which to build your version of the ultimate affordable sniper setup than the Savage Tactical. 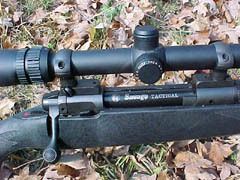 The Savage Tactical Rifle as outfitted by the Author. 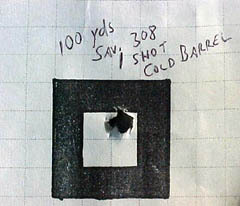 Target shows effectiveness of the Savage Tactical Rifle for one-shot cold-barrel accuracy.